Once an invoice has been received from an NDIS Service Provider for a Client your organisation provides NDIS Financial Plan Management for, once it has been processed by Accounts Receivable and entered into your organisation's finance package, this needs to be added to the Client's NDIS FPM tab. It is important that your organisation has completed Steps 1 - 7 of the recommended Steps to set up and use the NDIS Financial Plan Management (FPM) functionality. Staff entering External Invoices will need access to the Plan Management Service the Client participates in set up in their Staff Account Privileges. 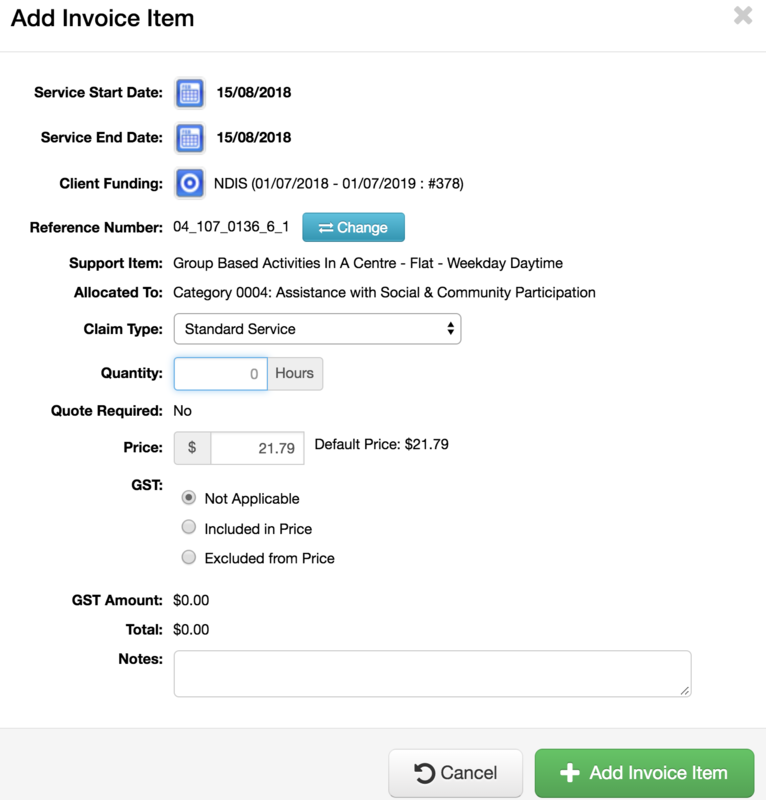 Once an invoice has been received from an NDIS Service Provider for a Client your organisation provides NDIS Financial Plan Management for, this can be entered into the Client's FPM tab. To enter external invoices received, select the 'FPM' tab in the Client's record. The 'Service Provider' Contact will be used in this example. 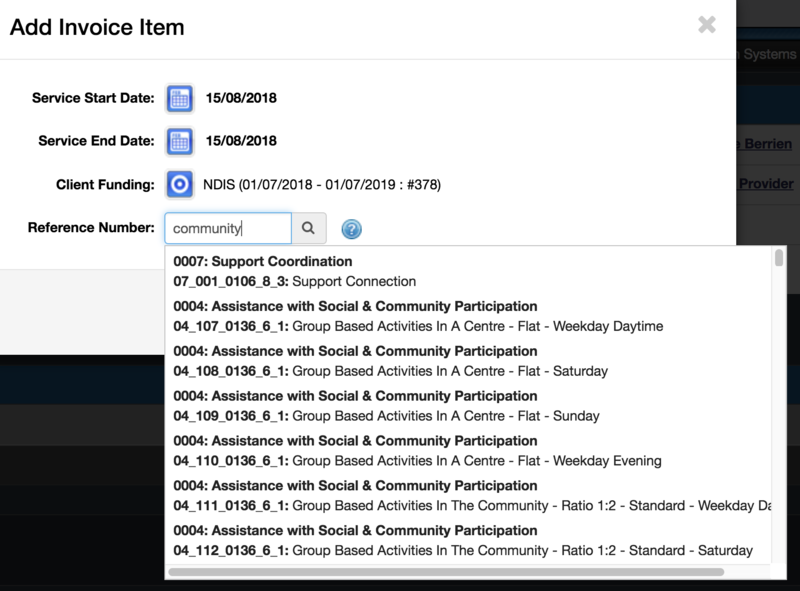 Please note, if the NDIS Service Provider is not available to select from here, the Contact record has not been created and/or set as an 'NDIS Service Provider' as outlined above. There is an option to enter Start and End dates, which may be useful if you wish to align these with the Client's Service Agreement with the Provider. Any notes regarding the Service Provider may also be recorded here as required. N.B each of these are optional features. Once these details have been entered, select the '+' icon to 'Add a new invoice item' under the Invoice Items section. This is where the Support items for the Services delivered are entered. Select the relevant Support Item. Once this has been added, the details will display. N.B. Standard Service is the default. N.B. The applicable code will populate in the 'new' NDIS Bulk Payment Request 2018/19 file export e.g. NSDH, TRAN etc., based on the Cancellation Reason entered. N.B. These warnings are for guidance purposes only and does not inhibit a value higher than the Cancellation Price calculation being saved. N.B. These warnings are for guidance purposes only and will not inhibit a value higher than the Price Control maximum being saved where applicable. External Invoices must have the Sign Off performed, prior to be available for inclusion in an External Invoice Batch. This is designed to indicate the invoice is ready to be batched and subsequently imported into your organisation's Finance system, then converted & included in an NDIS Bulk Payment Request file. There are no specific permissions set to who can Sign Off an external invoice, if you have access to enter it, you can also perform the Sign Off.